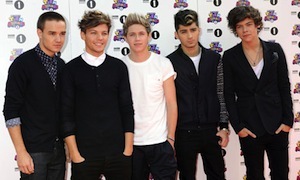 One Direction have announced details about their “On The Road Again” Tour 2015 including two dates at 3Arena, Dublin on 16th and 17th October. The band have also confirmed two dates at Odyssey Arena, Belfast on 20th and 21st October. UPDATE: Extra dates have been added both for Dublin and Belfast. The new Dublin date is 18th October, and the Belfast date is 22nd October. Tickets for the extra dates are now on sale. Tickets priced from €59.50 go on sale on December 6th at 9am. Under 16’s must be accompanied by a parent/ guardian, standing restricted to over 14’s only. One Direction’s new album ‘FOUR’ is out now.